Lake Tahoe is one of the nation’s premier destinations for vacation getaways in the US. The South Shore in particular has an abundance of Lake Tahoe activities whether you arrive in Winter, Spring, Summer or Fall. We have compiled all the information you need to plan your Tahoe vacation including lodgings in our vacation rentals, information on the local golf and ski resorts, interactive Lake Tahoe maps, weather, ski conditions, events, and even equipment rentals for all seasons. We have vacation specialists ready to help you find accommodations for your next Lake Tahoe vacation. We’ll help you select from a variety of fully furnished vacation rentals including cabins, houses, cottages, and chalets with features such as private hot tubs, lake views, and proximity to Heavenly, Sierra-at-Tahoe, and Kirkwood ski resorts. "Excellent service. They accommodated my needs in every way. Made my stay in Tahoe an extra pleasant one. Super nice staff and well-run office. Very responsive. I would totally use them again." "Very comfortable and relaxing vacation getaway! You guys were the highlight of our Tahoe experience!" "Perfect Size! TRC was great!" "Main office was great to work with!" "Your company made this an easy & great experience. Well Done!!" "You went above and beyond what you had to, We will recommend you to all our family and friends!" "Great location...staff was great!! Very helpful. Your staff was terrific in helping me find a house on very short notice. Thank you!" "I just don't know how you (Tahoe Rental Connection) can improve! It was an excellent experience staying at the rental & dealing with people who work there. Thank you!" 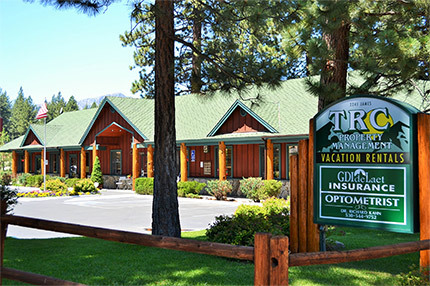 "Thank you to TRC for making our lakeside rental experience one of the best in Tahoe. We had an issue with the plumbing and Dan was on top of it and within one hour everything was back to normal!! It was amazing!! We recommend them and look forward to our next rental!" "We had an amazing time - this is the best home we've ever stayed in!" "My kids loved it! Excellent service! Great Front yard, perfect for kids! We loved it and we will be back again!" "Great time had by all! Clean, well equipped space will definitely be back!"